Best Equalizer For Android: From our point of view it’s best to avoid using equalizer since that alters the way the music developer actually intends the way it should sound. If you have a good quality earplug or headphone coupled with good sound processing method in your device that can produce quality music, we recommend you avoid using equalizer. But if you are a bass lover or listen to jazz, country, heavy metal or any other specific genre you may opt for using an equalizer. As that will improve your listening experience. What’s the point of listening music if you are struggling to enjoy it! Sometimes specific brands of headphone emphasize on bass or treble or midrange vocal, which may not be what you are looking for but somehow ended up buying it. In that case using a good equalizer might be a preferable decision. But let us inform you that not all headphone reacts similarly to the same setting of equalizer. Some headphones or earplugs will not even react to the equalizer because of their build material. Choosing the right equalizer can be tricky. That is why we listed 5 best Equalizers for Android that we found most effective. Although you will only need one among them depending on your choice and need, we recommend you test it out by yourself to find your best equalizer for Android device of yours. At number one of our best equalizer for android list we put Equalizer simple because it gets the job done and its packed with a whole lot of features that works for almost everybody. But mostly because it is free! The interface is simple and user-friendly and it comes with a Bass Booster, Reverb, Virtualizer, Auto Detection. Equalizer also works with streaming music, which we found as a paid feature in most other equalizers. 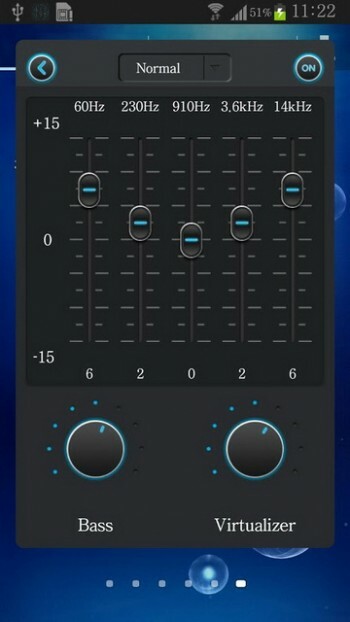 What makes this equalizer special is because the presets for different types of music is placed right on the main screen of the app, making it fantastic for some of the users who doesn’t want to meddle with the sliders to get their own settings. The app consumes low CPU and RAM making it very stable use. Unlike other equalizer, Equalizer & Bass Booster mainly focuses on boosting the bass. It also has one of the most coolest looking interface but more importantly along with audio tracks it also works with the videos that you have already downloaded including the videos of many online sources like YouTube, Pandora, Chrome etc. On the negative side although the desktop widget looks great, Equalizer & Bass Booster in fact eats up a lot of RAM, which eventually might lead to some unfortunate distorted noise, if you have less than 1GB ram on your device. It has one free and another paid version. With paid version you will get an active developer support, which in our view is not quite necessary. It has Bass Boost and Virtualization along with 12 presets for different genre of music. You can also make your own presets. The newer version supports quite a few streaming service like Pandora, Spotify, TuneIn Radio, VK etc. Although the equalizer does not work with FM radio, it is still one of the best equalizer for android that you should check out. One thing that headphones for android device are mostly accused of is the low audio sensitivity level resulting in low volume for certain frequencies. Headphones Equalizer is programmed keeping the limitation of headphones in mind. Headphone equalizer has a built in audio calibration for headphone which you can set up both automatically or manually. After calibrating Headphone equalizer selects required presets automatically if you activate the auto-genre function, which makes the concept really amazing to check out. The reason why it stands out is because of the float screen equalizer display which gives it a unique look that goes well with the blue and white colored theme. Although the equalizer is only 5 bands but it comes with 9 presets, which we did not expect from a float screen equalizer app! Also the 3D virtualization performs quite well. These are the five best equalizer for android that we think are worth checking out. Although users experiences may change based on the android version and audio devices being used. We recommend using a better quality headphone or earplug to get the most out of these apps on your device.